Content you posted in-game has been deleted. Violation: Advertising and/or Promotional Content. What do you do when a console manufacturer deletes your drawing because they mistake it for a light novel advertisement? YOU WRITE 20,000 WORDS OUT OF SPITE IN A SINGLE WEEK. Hey hi my name is Alex Zandra and I do a lot of things; one of which is draw fake light novel covers (silly situation + excessively long title) and post them to Twitter. 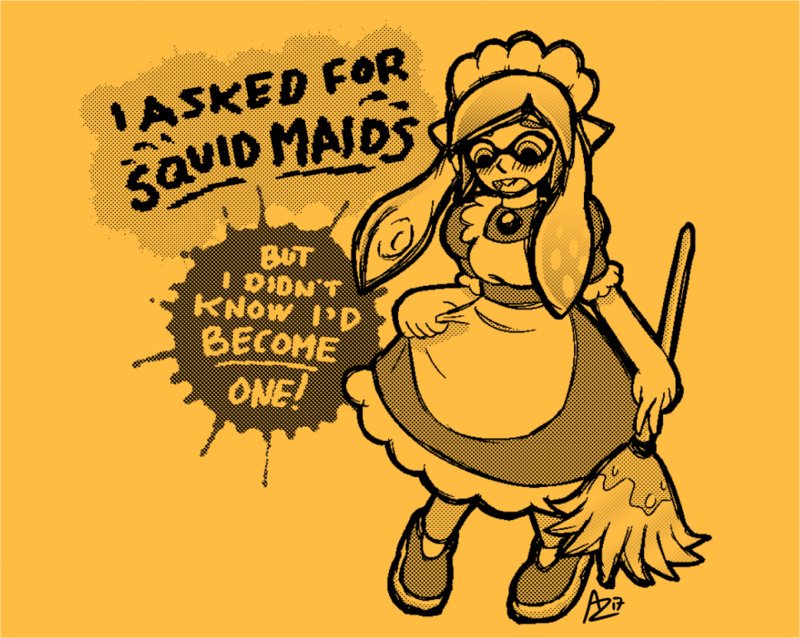 When folks started drawing in-game postcards about squid maids in everyone’s favorite paint-based multiplayer phenomenon, I made one of my own! But two days later, I got the message above. The decision was final. So I decided to prove them right—by actually making the book a reality. And now it’s here in your hands! So settle in for 64 pages of maids, squids, squid maids, self-discovery, and a LOT of gender feels. Because that’s what I do. Please enjoy, and let’s keep making wonderful things together. This is the digital version of the book; if you'd like the physical one, please head on over to my shop! This was a really fun read. It certainly did have the feels. Brook is a cute character and it was great to follow her through her journey. I haven't even played the games yet, but I really like the character designs... and maids. So this caught my eye and I plan to read your other books soon. Good gravy gracious this light novel is so good! It's highly concentrated sweet which I really needed. Highly recommend! !